What do a dashing skeleton, some beautiful feathers, Shakespeare, and a Zebrule named Romulus all have in common? These are the images selected from the University’s Images Online collection for our new Resource Lists @ Edinburgh postcards! The images have all come from the University’s Images Online collection (images.is.ed.ac.uk) which displays and highlights images of resources held by the University of Edinburgh Library. The images that have been created by the University’s Digital Imaging Unit are freely accessible to all and well worth a look. Proving particularly popular is the design featuring an image of Romulus the Zebrule. Romulus was bred by Scottish zoologist, James Cossar Ewart at Penicuick in the 1890s. If you are as curious about Romulus as we were further information can be found over on the Towards Dolly blog post – Zebra Crossing – James Cossar Ewart, Romulus and the Penicuik Experiments. The above workshops are bookable via MyEd. If you are interested in Resource Lists @ Edinburgh but can’t attend on these dates, please get in touch. We are happy to arrange alternative training sessions for individuals or small groups. More information is available on the Resource Lists using Talis Aspire webpage and the ResourceLists@Edinburgh Blog. This entry was posted in Library, Online library resources, Research & Learning Services and tagged Library Learning Services, Resource Lists @ Edinburgh, Romulus on May 30, 2014 by Stephanie Farley - Library Learning Services. We’ve organised two hands-on sessions in June to introduce Resource Lists @ Edinburgh using Talis Aspire. Sessions are bookable via MyEd. The sessions will begin with an Introduction to the Resource List system followed by a hands-on workshop where attendees will be able to try out the system and start creating their own Resource Lists with the support and guidance of Library Staff. The sessions are open to all Course Organisers, Programme Directors, College/School IT staff or Admin staff and Library staff who may create lists on behalf of others. When you register for the session, you will be sent an email inviting you to register to use Talis Aspire. Please follow the link in the email to accept the invitation. This will give you access to the Resource List system. If you are interested in Resource Lists @ Edinburgh but can’t attend on these dates, please get in touch. We are happy to arrange alternative training sessions for individuals or small groups. This entry was posted in Library, Uncategorized and tagged advocacy, Resource Lists, Talis Aspire, training on May 22, 2014 by alaurins. An introduction to Talis Aspire Campus Edition, used by Resource Lists @ Edinburgh to provide dynamic reading and resource lists for staff and students. This entry was posted in Library, Online library resources, Research & Learning Services and tagged Library Learning Services, ResourceLists, ResourceLists@Edinburgh on May 21, 2014 by Stephanie Farley - Library Learning Services. Did you know that Library Learning Services are able to take your existing Reading List and turn it into a Resource List for you? As this semester winds down we all start looking towards the new academic year. If you have an existing reading list that you would like to see transformed into an interactive online reading list we can do this for you! Simply send us your list, and the earlier the better. Part of this service also includes providing a summary of the items on your list, books, journals and articles, with information on how many are held and at what locations within the University of Edinburgh Libraries. This means you can see in advance where additional materials might need to be ordered or moved into reserved/short loan sections of the library. The earlier a request is placed for additional library materials the greater the likelihood they will be on the shelves ready for students in the new academic year. Send us your reading list and we will transfer it into a resource list on resourcelists.ed.ac.uk for you, then place it back in your hands for any alterations and to publish at a time of your own choosing. We will provide information on how to edit and maintain your Resource List once it has been handed over to you, and we are available to answer questions and provide Resource List guidance during every step of the academic year. Additional training and assistance in the maintenance of the Resource Lists can be arranged by contacting Library.Learning@ed.ac.uk. This entry was posted in Library, Online library resources, Research & Learning Services on May 16, 2014 by Stephanie Farley - Library Learning Services. It was announced yesterday that the renowned surrealist artist H.R. Giger, best known for his creation of the alien monster for the movie of the same name has died at the age of 74. In addition to the unsettling and terrifying sets he created for Ridley Scott’s films, in the art world Giger is appreciated for his wide body of work in the fantastic realism and surrealistic genres. He was named to the Science Fiction and Fantasy Hall of Fame in 2013. Library Learning Services have created a Resource List in remembrance of H.R. 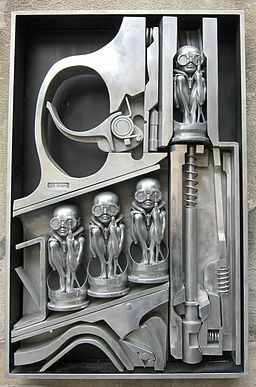 Giger for anyone interested in learning more about this fantastic artist and his works. 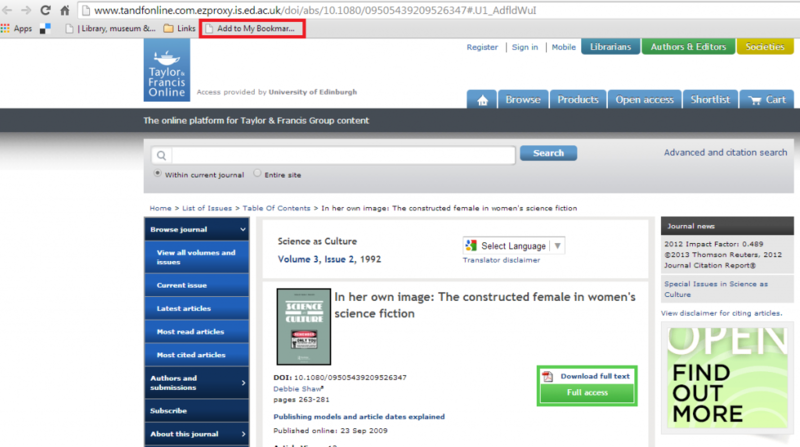 This entry was posted in Library, Online library resources, Research & Learning Services and tagged H.R. Giger, Library Learning Services, Resource Lists, Resource Lists @ Edinburgh on May 14, 2014 by Stephanie Farley - Library Learning Services. As part of the integration with Learn we have needed to change the way a semester time period is assigned to a Resource List. We have created a short guide with screenshots further detailing the process. All Resource Lists for the next year should be assigned to this time period. This new time period will cover 1st April 2014- August 2015 in order to accommodate schools whose teaching year falls outside the official semester dates. If you are working on a draft list (i.e. an unpublished list) please change the time period for each of your draft lists now. Use IE (Internet Explorer) or Chrome to make the change. Note: The pop up box contains text saying it will publish the list with this save. Don’t worry it won’t publish your list. This is a bug in the system which is currently in development to be changed. Make the change and save, your list will remain unpublished until you click on the ‘publish’ button. If you want to make it clear that a list is for a specific semester add extra information to the List Title. Note: If the list covers both Semester One & Two there is no need to add this information to the List title. No action is required. We will change the time period information for you. A guide will shortly be available via the blog and IS website describing, in more detail, how to create a list and assign time periods. In the meantime, if you have any questions, please get in touch. This entry was posted in Library, Online library resources, Research & Learning Services and tagged Library Learning Services, ResourceLists, ResourceLists@Edinburgh, Service Update on May 12, 2014 by Stephanie Farley - Library Learning Services. Resource Lists using Talis Aspire provide a great deal of room to experiment and find the structure that best suits your course. Some courses prefer to format their lists by weeks in the semester, others by topic and yet others by essay questions or the relevance of each resource. To demonstrate this the Library Learning Services team have created a selection of List Guides and example lists on ResourceLists@Edinburgh including examples of a variety of resources and explaining the additional features available for your use. 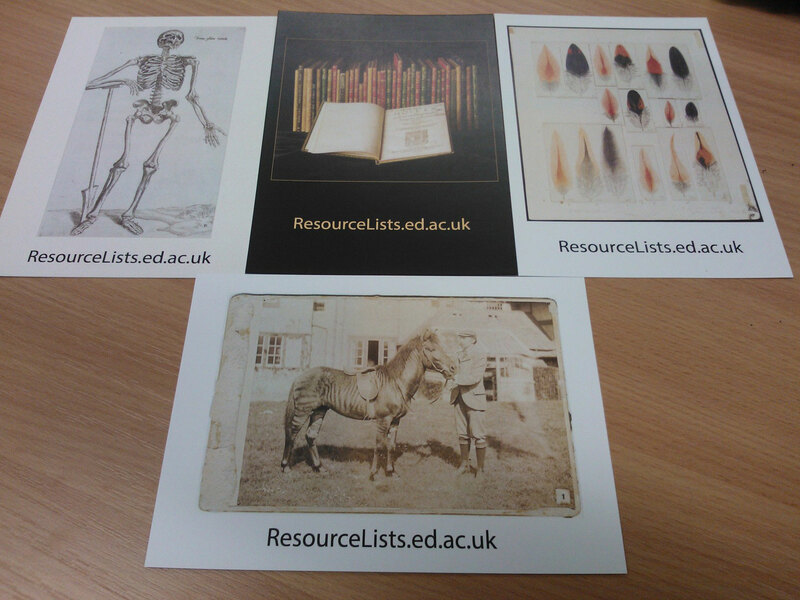 Visit the Library Guides webpage at ResourceLists@Edinburgh to browse through the example lists for ideas on how Resource Lists can benefit your course. This entry was posted in Library, Online library resources, Research & Learning Services and tagged Library Learning Services, ResourceLists, ResourceLists@Edinburgh on May 8, 2014 by Stephanie Farley - Library Learning Services. Bookmarking and adding a journal article to your Resource List is a straightforward process. We have created a short guide with a few tips on how to ensure that that your bookmark links in the best possible way. – Always click through to the webpage displaying the actual journal article to create your bookmark. – When creating your bookmark check that the ‘Online Resource’ button is ticked. If it isn’t then make sure to tick the box. – When prompted by the popup box asking which URL or link you would like it to use, always select the DOI (Digital Object Identifier) if offered or a URL that includes the text ‘stable’. Bookmark directly from an online journal or database. The University of Edinburgh also provides Searcher, a discovery service that you can use to search many of the Library’s online resources, including e-journals and articles, from a single search box. This entry was posted in Library, Online library resources, Research & Learning Services on May 5, 2014 by Stephanie Farley - Library Learning Services.